The World’s most loved musical ANNIE is on at the Olympia Theatre in Dublin until 26th July. 11 Year old Irish Girl Nastasia Vashko plays the lead role in the new Irish Production of Annie. Based on the popular Harold Gray comic strip, "Little Orphan Annie," the Broadway musical opened on Broadway in 1977, won seven Tony Awards and continues to be one of the most popular musicals internationally and a great family draw. With a cast of 37, "Annie – The Musical” will include the memorable songs “Tomorrow”, “Hard Knock Life”, “I think I’m Gonna like it here”, “You’re never fully dressed without a smile”. EAST COAST FM and CITYWEST HOTEL have come together to give away a super prize this evening between 4pm -7pm on EAST COAST DRIVE tonight (Fri 10th July) with JOE HARRINGTON. Tune in and answer a simple question for your chance to win. The winner will be announced this evening between 6.30 and 7pm on EAST COAST DRIVE. Just something weird I came across today ... I love Christmas, but not in July! Some of this year's must-have toys are being are being previewed later. The "Christmas in July" fair in London includes the first look at the new Rubik's cubes. A touch-screen version of the 80s icon will set you back stg£150! Find your house with the birds-eye view feature in the new Bing Maps from Microsoft! Wicklow host Cavan in the 2nd round of the All Ireland Qualifiers on Saturday evening @ 7pm in Aughrim. We'll have live coverage on East Coast FM with Michael Sargent (left) and the East Coast Sport Crew. Breaking news - Halfwit is not up for eviction this week and rumours on the web say that Noirin and Karly are up - they will be joined by Siavash and Dogface who faces eviction for discussing nominations!!! We have €10,000 of prizes to be won in the great DID Electrical Summer '09 Giveaway! 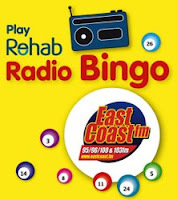 There's great prizes to be won every week and its so easy to win ... just send in your old Rehab Radio Bingo books to East Coast FM, Killarney Road, Bray for your chance to win some amazing prizes, all with thanks to DID Electrical, Southern Cross Retail Park, Bray (don't forget to include your name, address and phone number!). Each Friday a draw will take place, with eight winners announced by Declan Meehan on The Morning Show. 50:50 Friday is on again on Friday July 17th. Our exclusive offer consists of €200 vouchers from the newly refurbished Newpark Hotel in Kilkenny which has unveiled it self after a multi million euro refurbishment. You can buy the vouchers for just €99! Well it's sort of great to be back!I was up at four this morning because I think my bodyclock is still on US time. I spent 10 days in Tulum in Mexico which was amazing- really nice and relaxing with beautiful beaches and then four not so quiet nights in NY including the 4th of July which was lively to say the least! Ryan O'Neill is in on Lunch all this week. Greg Gaughran is on holidays.